World War Z is actually something that I read last summer. At the time, I felt too embarrassed to actually review it, after all it is a dime-a-dozen zombie thriller with a depressing cast of stereotyped characters and little common sense. The most awkward part? I actually liked it back then. In order to determine if it was only a passing craze brought on by living in Vancouver (and oh I miss that place) or actually a decent piece of fiction, I decided to give it another go. This time the feelings were not so favourable, but overall World War Z is not bad. The author’s vision for a zombie apocalypse is enticing and draws on so many aspects of the global, modern society that it feels (to the degree that a silly zombie book can) plausible. Nations act like they just might in the event of a real conflict. Israel quarantines itself, China denies everything and the USA fails to see the pattern until it is too late. The tales draw heavily on modern political action, which does give the tale some much needed heft. However, there is no getting around the fact that the overall premise is utter baloney. So many times, I had to skip over a section that felt ridiculous or skim through a chapter that I remembered from last summer. Nothing here is worth reading twice, unless you are once again bored on your summer vacation. There just isn’t that much thematic depth to warrant a reread. But as I said before, it is in no way a bad effort. 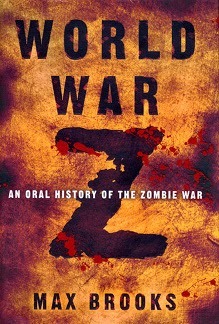 World War Z is the only zombie book that I will ever read, and I imagine most of the others to be at least somewhat inferior to this one. World War Z is a comprehensive, imaginative take on what would happen if the dead reanimated and started craving living tissue to eat. For me, however, the “if” in the previous sentence is just too big an obstacle to ever find this book reasonable.